Welcome to The Weekly Gene, a blog series brought to you by Helix that introduces a different human gene each week. We’ll share important facts, relevant research, and how these genes might be related to certain conditions and traits. It’s a great way to build your DNA vocabulary, learn more about the code that makes all of us unique, and find a path to the genetic insights that are important to you. Want to know more about a specific gene? Let us know by tweeting @my_helix with #WeeklyGene. Chronically high levels of sugar intake can lead to problems. But while many conversations about blood sugar are specifically related to disease, did you know that your body actually needs sugar? Sugars are an important part of our diet, and we’re genetically programmed to seek it out. This seemingly contradictory statement can be confusing. Why would we need sugar? If we’re programmed to find sugar, why does it cause health problems? Do some individuals process sugar differently than others—and if so, why? 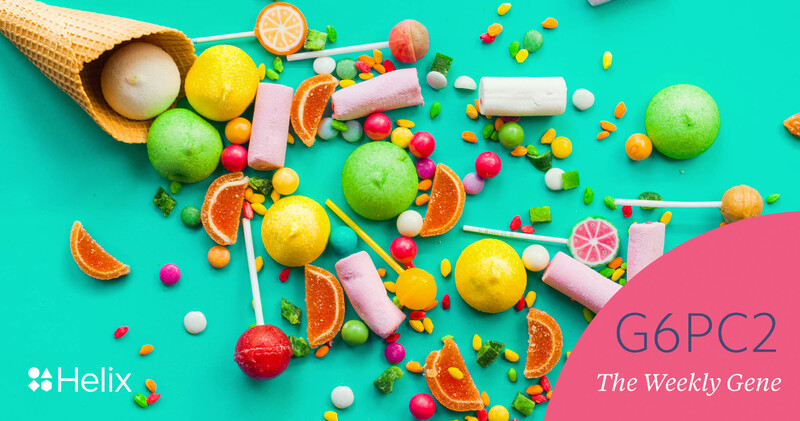 These questions are especially relevant this week with Halloween right around the corner, so we wanted to briefly talk about sugar in the human body and how genetics can influence a healthy person’s blood sugar levels. Humans have evolved instincts to both recognize and seek out sugar-rich foods because they provide a source of energy. Early in human history, sugars were hard to come by, primarily coming from foraged fruit. Our ability to smell and taste sweet things helped us find plants that were nutrient- (and sugar-) rich, which—when combined with the activation of reward centers in the brain—generates cravings for more sugary foods. Once in the body, sugars are broken down to a basic form known as glucose. Glucose is used by every cell in the body as a source of energy, and is required for normal cell function. Glucose is circulated throughout the body via blood in the circulatory system to ensure that every cell has access to nutrients, oxygen, and sugar. Cells actively take glucose from the blood through a series of proteins that coordinate the uptake of glucose, and likewise regulate a cell’s ability to release excess sugar back into the blood. One such protein is known as glucose-6 phosphatase catalytic subunit 2, or G6PC2 for short. This protein is primarily found in the pancreas and enables the release of sugar back into the bloodstream by preventing cells from holding onto it. Through this action, G6PC2 and other similar proteins play an important role in the regulation of blood glucose levels. When blood glucose is high, the excess sugar can be stored in body tissue (such as fat cells). During human evolution, the ability to store this energy source was critical because our ancestors would experience long periods of time without food, during which time they would rely on these stores for energy. In modern times, though, our craving for sugars—and the body’s ability to store them—can be problematic given the prevalence of sugar in processed foods. High levels of glucose in the blood for an extended period of time can damage blood vessels and lead to diabetes. To maintain normal sugar levels, our body relies on the pancreas. This organ senses the amount of sugar in the blood by taking up glucose and, in response, releases the hormone insulin. Insulin circulates throughout the body and helps other cells manage the uptake of sugar. The release of insulin is highly dependent on the amount of sugar retained within pancreatic cells. G6PC2 decreases the pancreas’ ability to detect sugar in the blood by preventing glucose retention in pancreatic cells. This means that proteins like G6PC2 are an important part of pancreatic function. Interestingly, some people have a different form of G6PC2 due to an inherited change in their DNA which can predispose them to slightly higher levels of blood glucose. This variant alone does not result directly in dangerous or unhealthy blood sugar, but may lead to a baseline blood glucose that is higher than others. This DNA variant in G6PC2 is believed to affect production of the protein by impairing a process known as mRNA splicing. DNA carries information that is used to build proteins. The intermediate messenger that helps the information coded in DNA become proteins is known as messenger RNA, or mRNA. Splicing is a critical process when making proteins, and the inability to appropriately process the G6PC2 mRNA affects the protein product. In terms of glucose processing, the inability to splice the G6PC2 mRNA reduces activity of the protein. Research has shown that variants rendering G6PC2 less active are associated with increased blood glucose levels. Note, there is natural variation within a healthy range, and this variant alone is not known to cause diabetes, but might be of interest for someone looking to better understand their blood sugar. If a person is concerned about diabetes, they’re encouraged to talk with an expert for more information. The ability to seek out and process sugars may be coded within our DNA, but it’s not the whole story. Consuming lots of sugar in your diet has a bigger impact on your blood sugar than G6PC2 variants, for example. It’s also important to remember that genetics are not always deterministic. In many cases, a person’s environment and life choices can help them overcome predispositions. Likewise, just because someone doesn’t carry the higher blood glucose associated variant of G6PC2, it doesn’t mean they will never have high blood glucose. People who carry this variant can make informed decisions about their diet that may help meet their goals related to their blood glucose levels. DNA tests are available that can help people determine how their body is genetically programed to metabolize nutrients, including the variant of G6PC2 gene that they carry.